Ghosn has pointed Renault toward a new goal: a 7% operating margin by 2022. For an executive such as Carlos Ghosn, who thrives on challenges, the automotive industry has provided a never-ending "to-do" list. When the Renault Group CEO stepped on to the podium in Paris during the automaker's financial results conference earlier this year, he emphasized that Renault had met the targets of its Drive the Change strategic plan a year early. "We achieved record growth. We achieved record profitability, and we have a record cash position," he said. Even as he spoke, major changes were about to happen. Within weeks of releasing Renault's numbers Ghosn announced he would step down as CEO of Renault's Japanese partner, Nissan, to focus on the two companies' alliance. Then, on March 6, Renault's French rival, PSA Group, announced it was buying Opel/Vauxhall from General Motors, creating a joint company that would eclipse Renault in European auto sales. Experts, however, don't expect either change to throw Ghosn off course. "He loves a challenge and gets bored when things are going too well," said Miguel Rivas-Micoud, a consultant and educator in Japan who collaborated with Ghosn on a book about business strategies. Debating the question of when Ghosn, 63, will step down from his other roles as CEO of Renault and the Renault-Nissan alliance, which also includes Russia's AvtoVAZ and Japan's Mitsubishi, has been a longtime favorite of industry watchers -- but now is probably not the time, analysts said, especially since Ghosn has so much left to accomplish. This autumn, Ghosn will unveil a successor to Renault's Drive the Change plan. Under the old strategy, group revenues increased to 51.2 billion euros last year from 39 billion euros in 2010 and the operating margin rose to 6.4 percent from 2.8 percent during the same period. Ghosn already revealed two of his next targets for Renault: revenues of 70 billion euros and an operating margin of at least 7 percent by 2022. Renault will start its new plan with one of the youngest portfolios in Europe, after finishing off a model renewal cycle that helped boost 2016 sales 12 percent in the region and 13 percent globally. Despite the sales surge, Renault's auto division had an operating profit of 4.5 percent. "If you look at Peugeot, they've been delivering 6 percent, which is quite impressive," said David Lesne, an analyst at UBS, "but Renault is still below this level in the automotive business -- they should be able to raise this." Ghosn has said that PSA's acquisition of Opel won't affect Renault's plans, but Thomas Glendinning, a senior automotive analyst at BMI Research, said the deal will create a formidable European competitor that Renault will have to watch. "PSA has made great strides in terms of getting profitable, of styling and of looking for opportunities in the higher end and trying to break out of the mass market," he said. "Renault needs to up its game there as well, instead of getting caught in the mass market in Europe." With sales expected to slow in the overall European market, analysts see more of Renault's growth coming from markets such as Latin America, India and Brazil. The Kwid small crossover, which has been a hit in India, will be assembled and introduced in Brazil this year, as will the Captur, Renault's best-selling SUV in Europe. Experts also expect Renault's new plan will further intertwine the French automaker's fortunes with Nissan and Mitsubishi, the newest member of the alliance. Ghosn says he will be looking to accelerate synergies among the companies through shared platforms, purchasing, manufacturing and technology. The current target is to achieve savings of 5.5 billion euros by 2018 from those synergies. To that end, several cross-alliance groups have been created in the past year, including a connected car initiative headed by Ogi Redzic, and, as of April 1, a light commercial vehicle unit led by Ashwani Gupta. "I think the new plan will be very much focused on product," said David Lesne, an analyst at UBS, including a renewal of the Dacia range and another product cycle for Renault. "But at the same time, he will be looking to see to what degree the alliance can create a competitive edge." Lesne said he would like to see a clearer electric vehicle strategy, as more competitors enter a segment that Renault and Nissan have dominated, especially as the market for diesel shrinks because of regulatory pressure and emissions-cheating publicity. Last year more than half of Renault's sales in Europe and France were diesels. Lesne said Renault-Nissan needs to capitalize more on its multi-billion-euro investment in EVs. "The level of integration for EVs is going to be important," he said, pointing out that Renault and Nissan are developing a shared platform that is due to debut by 2021. While VW Group has taken the brunt of the bad press because of its cheating on emissions tests automakers such as Renault have also faced questions about the level of pollutants produced by their diesels. In March, a French newspaper published what it said were details of a government report that accused Renault of defrauding consumers with software that allowed cars to pass European Union emissions tests. Renault shares fell on news of the report, which said that Ghosn, as Renault CEO, should be held responsible, and that the company could face billions in fines. Other automakers, including VW and Fiat, are facing similar judicial scrutiny in France. Renault has said repeatedly that its engines comply with current regulations. Ghosn said in February that he saw no reason to set aside cash to cover any penalties because, "we know what is in our engines." 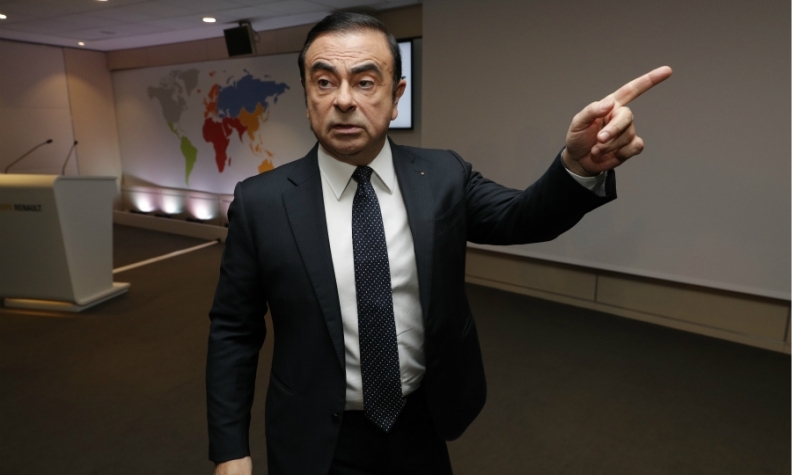 Ian Fletcher, a principal analyst at IHS Markit, said that although the reports have implicated Ghosn, he doesn't believe the CEO will deal with the claims directly. "He will be looking at the long-term strategy of the business," Fletcher said. One key part of Renault-Nissan's strategy will be helping AvtoVAZ turn around. Under Ghosn, Renault has doubled down on its investment in the money-losing maker of Ladas, participating in a 1.2 billion euro recapitalization last year and consolidating AvtoVAZ into its balance sheet. Russia was once Renault's most profitable market, but overall auto sales there have shrunk by nearly half in the last four years while the country's economy staggered under falling energy prices. Renault took a 620 million euro hit on AvtoVAZ in 2015, but reduced the damage to 89 million euros in 2016. If the market recovers and Ghosn can push through a midterm plan for AvtoVAZ that includes new models from shared platforms, inventory and factory cost reductions as well as increased local parts sourcing, Russia could again be a profit champion for the alliance. Lada, Renault, Nissan, Datsun and Infiniti together have about a one-third share of the passenger car market there. "They're already making headway," Fletcher said, "but I think there is more work to do because of where the market sits." There is also more work to do, analysts argue, to further leverage the alliance's strengths. The sticking point in further Renault-Nissan consolidation has been the French government's 20 percent share in Renault. Ghosn said this year that Nissan would not agree to alter the alliance's current structure, in which Renault holds 43 percent of Nissan, which in turn holds 15 percent of Renault, unless France sells or reduces that stake. Still, BMI's Glendinning said, "I don't think we'll stick to the status quo for more than a few years. The more these businesses are tied together with shared production and platforms -- that all signals a closer union going forward." The other question hanging over the alliance is: How long does Ghosn want to be in charge? He has handed over his CEO title at Nissan to Hiroto Saikawa and his term as Renault boss expires in 2018, though a provision allows him to serve past the company's retirement age of 65. No clear favorite has emerged at Renault as several top executives groomed under Ghosn have left the alliance in recent years, including Carlos Tavares, the former Renault No. 2 now running PSA, and Andy Palmer, now CEO of Aston Martin. "He's potentially behind an absolute juggernaut in an industry that's moving toward consolidation," Glendinning said. "He's at the helm of one of the more promising of these automotive titans. So, I think, if anything, he's still got a lot of reasons to stay."